As Genilee reported in her last blog, we installed a new program, Dragonspeak, on my computer to help me dictate. This is my first attempt at writing the blog on it. I began last night at 11 p.m. when I wrote the first draft of this column, and thought I had saved it. To my dismay this morning I couldn’t find it anywhere. Oh well … on to draft two! 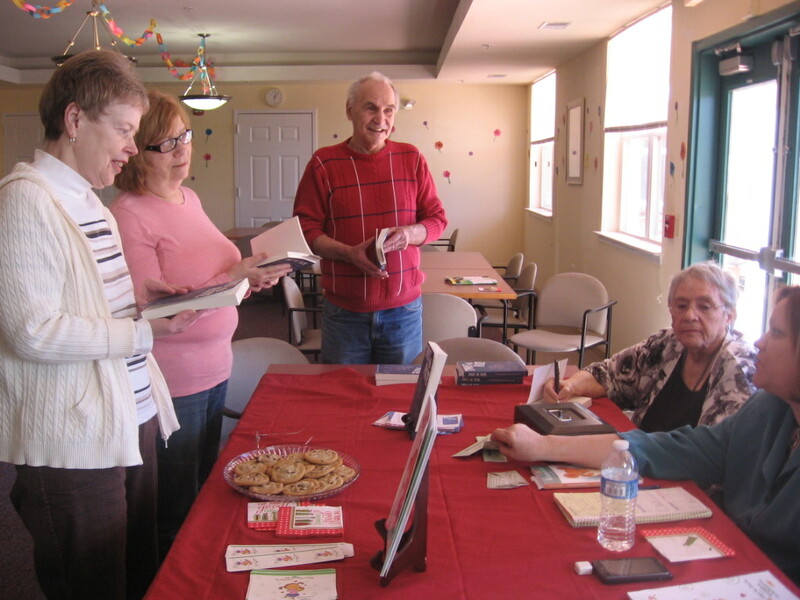 Last week Genilee and I had a book signing at Potomac Woods homes in Woodbridge. We deemed it a success because we sold eight books. My daughter and fellow author, Allyn Stotz, told us that it’s generally accepted that if you sell three books at a book signing, you are doing well. She urged us to be patient, but I’m glad for her encouragement because by those standards, every one of our signings has been a success! And selling eight books was a tremendous success! Part of the reason is the people that help us out, as Genilee has pointed out in this blog. The same can be true at Potomac Woods. Mary, a resident there and a manager for Dress Barn, Genilee’s favorite shop, told her friends about this book signing, then went into work late just so she could pick up another few books! Anyway, her friends and quite a few residents showed up thanks to the publicity the community provided, and we are very grateful to them not only for buying our book, but also for answering our questions. We took advantage of the time we had to brainstorm about ideas on other places to hold book signings. All of those in attendance were extremely helpful, and we want to thank them as well as Mary. Book signings are really fun for us because the people who come are full of encouragement. This week, we are really excited because for the first time, we’re guest authors at a book club—the Scarlett Hatter Book Club. We probably won’t sell many books, but we get to talk about Twist of Fate and hopefully get their comments and suggestions. Part of the reason it was possible to do this is that our book is now in the Potomac Community Library and the Prince William County library system. That’s also an exciting development for authors, and we’re pursuing getting another nearby library to carry the book. Our second book, Wretched Fate, is now at the publishers. We are hoping for publication soon (doesn’t everyone? ), though we don’t know yet what corrections and changes we’ll need to make. We’ll keep you informed via this blog and our facebook page at http://www.facebook.com/genileesharon.swopeparente. We also just found out that Allyn has her own facebook page at www.facebook.com/AllynStotz.author. Show your support for our fellow writer by visiting and liking her page, as well as her blog at http://allynstotz.blogspot.com/. Meanwhile, we are also working on our holiday short stories. This will contain 12 stories for 12 different holidays, and I think our readers will find them both unique and heartwarming. We hope to get this published before next Christmas. By the way, “Hi” to Verna, my very special friend. Although I’ve been writing all of my life and spent many weeknights and weekends working on creative pieces, I’m fairly new to the author’s profession. Twist of Fate will be the first book I’ve had published. Like my coauthor and mother, I wish I’d started earlier; but I’m ever so glad I finally got around to it. However, I have to admit being an author is driving me insane. You get to the end of that first draft, and you’re ecstatic. Finally, I’ve finished a whole book. You celebrate with a glass of cheap wine and a bubble bath. The next day, you begin reading through it again and realize how much work there is yet to be done. That’s a tough morning, but you get through it, and you settle back into your writing routine. Many more weeks of work pass. A second draft, a third draft, and one day you just realize: this is as done as I can be. You’re ecstatic—you’re finished at last. You celebrate with an expensive glass of fine wine and a massage. But then the real work begins—you need to find a publisher. You become your own secretary spending months researching on the Internet, narrowing the list of places to solicit to those that might be interested in your story. Then, 55 rejection letters and many crying jags later, you receive two emails in the same day asking for more info, the full manuscript. A contract arrives. You’re ecstatic. You pop open the bubbly—real champagne. You take your husband to dinner. And then the real waiting begins. The publisher has a lot of projects in the hopper and an editing/approval process to get through with each one. You understand that reality, but begin biting your nails as weeks, then months go by. You get back comments from the publisher, go through several more drafts, keep your spirits going in between drafts by writing, writing, writing on other projects. Your hair gets a little grayer. You add a few worry lines. A mock-up of the cover arrives, and you try hard not to run screaming through the neighborhood: the book is coming, the book is coming! Then one day, an email arrives that sends you over the top: “Twist of Fate’s publication date will be mid October.” It’s time to buy champagne for the entire neighborhood, massages for all your favorite friends, dinners for your entire family and gift baskets for every person who helped with the book. OK. That last bit didn’t really happen yet, and I’m trying hard to contain my urges to celebrate. But I can see that being an author is dangerous – at best you’ll go broke. And at worst, you’ll be glad several of your dear friends are psychologists! Although my title suggests I’m about to give you tips on how to live through that awful period of “radio silence” when your editor is giving a final polish to your book and you have no publication date yet but many people asking when they can see your creation, I’m afraid I can’t do that. I can only tell you there is no “art” involved with patience. Only fingernail biting and finding ways to keep going instead of losing steam or getting angry with promises that don’t arrive when you expect them. Patience, as the saying goes, is a virtue, and one that doesn’t come naturally to most of us. You’ve spent every free moment for the last year and a half writing, squeezed out as much material as you can from the cells in your brain that birth creativity, put feelings and emotions you didn’t know you had into your work. So why do you have to wait to share it with the world? I say it’s because you are not writing just for yourself, but for your readers. If you care enough about what you do to want to get it into the hands of the right audience – the people who feel something similar to what you felt when you created your masterpiece in the first place – you have to take the right steps. In the publishing world, that means waiting for the decision makers – editors, production people, then the marketing staff – to do their jobs and do them right. They are in the business to make money and if you’ve placed your creation in their hands and they asked for a contract, that means they believe in your project. But they need time to make it happen. Only a handful of artists are lucky enough not be forced to play the waiting game, and that handful probably doesn’t appreciate success to the degree that you will if you stick it out. The important thing is to never give up. And while you’re waiting, work on the less polished aspects of your art. Finish that second book; write a short story; start a blog. You’re supposed to be an artist, and that means, you’re supposed to love the journey as much as the destination. If you’re awaiting arrival at the next station, just remember your can always distract yourself by working on a side trip.